LAKE SUCCESS, N.Y. Aug. 19, 2004 - Designed for advanced amateurs, photojournalists, wedding photographers and professionals who purchase their own equipment, Canon's new EOS" 20D digital SLR combines speed, image quality, ease-of-use, and ruggedness with compact size and light weight to deliver the highest performance in its class. Available in September, the EOS 20D digital SLR will carry an estimated street price of $1,499* without a lens; $1,599* with the EF-S 18-55mm f/3.5 -5.6 zoom lens; and $1,999* with the new EF-S 17-85mm f/4-5.6 IS USM Wide Angle Zoom lens†. The EOS 20D SLR has a new APS-C (15.0 x 22.5 mm) 8.2 megapixel CMOS image sensor designed and manufactured by Canon. It is the first mid-range digital SLR to offer high-speed continuous shooting of five frames-per-second with a burst of 23 frames at highest JPEG resolution. Uncannily responsive, the camera starts up in 0.2-second and has a shutter release time lag of only 65 milliseconds. The all-new 9-point AF unit with high-precision cross-type sensor raises the bar on speed, accuracy and precision in mid-range SLRs. The new AF system has one full stop better low-light performance than its EOS 10D predecessor. The new E-TTL II autoflash metering system, inherited from Canon's EOS-1D Mark II professional model, takes into account the distance, reflectance and position of the subject for highly stable, accurate and intelligent exposure calculations. The new camera's combination of speed and available light shooting capability make it especially appealing to newspaper photographers. Aside from the five frames-per-second burst rate, the EOS 20D digital SLR delivers superb low light performance and exceptionally low noise, even at high ISOs. In fact, images taken at ISO 1600 are approximately equal in noise to those taken with the EOS 10D model at ISO 400. The EOS 20D digital SLR can be used as a backup camera for the high-performance EOS-1D Mark II digital SLR. It is also an excellent choice in its own right for many professional imaging applications where its smaller size and lighter weight give it an edge. The Canon designed and manufactured CMOS sensor has a maximum resolution of 3504 x 2336 pixels, which is sufficient for very large prints (up to 16 x 24 inches) with fine detail. Like its big brother, the Canon EOS-1D Mark II, the EOS 20D digital SLR satisfies the wedding photographer's benchmark: facial details in group-shots. The wedding photography business is changing. Consumers are now looking for more natural and candid documentary coverage of their weddings. With the speed and large buffer of the EOS 20D digital SLR, wedding and portrait photographers have a cost effective solution for capturing both posed and candid event photographs. "Canon continues to endow advanced amateurs, photo enthusiasts and professional photographers with the highest-quality digital SLR cameras available by combining sophisticated camera features with the latest digital imaging technology innovations," said Yukiaki Hashimoto, senior vice president and general manager of the consumer imaging group at Canon U.S.A., Inc., a subsidiary of Canon Inc. (NYSE: CAJ). "In addition, Canon is one of the only companies in the industry that designs and manufactures the three primary components of its digital SLRs: Optics, Image Sensor, and Image Processor." Canon uses design and technology for customers' sake, not for the sake of technology. Canon has listened to owners of the EOS 10D digital SLR and has considered their opinions carefully. This accounts for the new menu format, the color-coded menu display icons, the reduction of buttons and the addition of the highly efficient Multi-controller, among many other features. The EOS 20D digital SLR is both smaller and lighter than the 10D model. The 20D camera is about 3.6 ounces lighter and Canon reduced the width, height and depth by 5.7, 2 and 3.5 mm, respectively. The shutter unit, mirror box, main mirror, pentaprism, focusing screen and viewfinder optical unit have all become smaller as they were optimized for the APS-C sensor. The 20D digital SLR has nearly 100 fewer parts than the 10D model. The new camera retains the rugged stainless steel chassis and magnesium alloy body covers of its predecessor for outstanding durability. The sophisticated 9-point autofocus system has a high-precision cross-type sensor in the center position. This new design seen for the first time in the 20D model provides full cross-type performance with maximum apertures as small as f/5.6, yet it achieves up to 3 times the standard focusing precision when used with EF lenses featuring maximum apertures larger than or equal to f/2.8. A new, convenient Multi-controller provides fast and easy AF point selection. The EOS 20D has a newly developed shutter with a top speed of 1/8000 sec., user-settable in 1/3 and 1/2 stop increments (in shutter speed priority AE and manual modes) and a maximum flash synchronization speed of 1/250 sec. First or second curtain flash sync is possible. The shutter's APS-C configuration allows a reduction in the size of the unit, smaller shutter blades with lower inertial mass, and shorter travel distance. Stronger magnets are used for each shutter curtain, permitting better control of the blades. A semiconductor switch replaces the traditional sync contacts, ending scorching and frictional wear while at the same time increasing the limit for trigger circuit voltage to 250V. The result of these changes is a more rugged and reliable shutter unit with substantially improved performance. Particularly among advanced amateur and professional photographers, there has been a growing need for affordable zoom lenses that support true wide-angle and ultra-wide-angle photography. In response to this market demand and to provide users with a truly comprehensive lens system, Canon has expanded its EF-S lens offerings to now include four lenses - the new EF-S 10-22mm f/3.5-4.5 USM and EF-S 17-85mm f/4-5.6 IS USM zoom lenses as well as standard and USM versions of the EF-S 18-55mm f/3.5-5.6 zoom lens. (Canon U.S.A., launched the standard EF-S 18-55mm f/3.5-5.6 zoom lens in August of 2003 in conjunction with the EOS Digital Rebel SLR.) The EOS 20D digital SLR is also fully compatible with all Canon EF lenses and with the entire system of Canon EX Speedlites and accessories, including the new Speedlite 580EX flash. The EOS 20D camera has professional level white balance controls. In addition to Auto, it has six presets, a Custom setting and direct specification of color temperature. White balance can be corrected for blue, amber, magenta or green; white balance bracketing, up to +/- 3 whole stops, can be performed for magenta-green as well as blue-amber. When the EOS 20D digital camera is used with the built-in flash or the new Speedlite 580EX, color temperature data transmission is enabled. The camera has an extensive complement of white balance controls, processing parameters, bracketing options, shooting modes and custom functions that permit the camera to be configured for any situation; the revised menu format, simplified control layout and clever new Multi-controller make the camera easy to use. Though still compatible with all EX-series Speedlites, the "smarter" E-TTL II system captures the subject as a "plane" and ensures that images containing various colors and levels of reflection are captured accurately and optimally. The system compares the ambient light with the reflected pre-flash off the subject reported in all 35 metering zones and selects the areas with a small difference to be weighted for flash exposure calculation. This system also eliminates or under weights areas with large difference recognizing them as an extremely reflective object in the background or as a highly reflective subject, smartly ensuring it by considering the distance information data provided from compatible EF lenses. The system similarly prevents over-exposure when photographers lock focus and recompose the shot by considering the flash output level calculated according to the broader distance. The camera also allows users to select an average metering pattern by using its custom function settings. The EOS 20D digital SLR includes Canon's latest CMOS image sensor technology as well as the new DIGIC II Image Processor. The CMOS features high-speed 4-channel data reading, brilliant new microlens technology, a 2nd generation, on-chip noise-reduction circuit, and low-noise, high-speed amp, which produces accurate color, extremely low noise and fast recording even at ISO's of 400 and above. Canon's DIGIC II image processor is without question, the most powerful imaging processor that the company has ever put into a digital camera. It boasts improved color reproduction of high-saturation, bright subjects, improved auto white balance precision, and wider dynamic range in highlight areas. In addition to its image quality improvements, the DIGIC II chip is also responsible for speeding up camera performance in areas such as start-up time, autofocus calculation, card-writing speed, direct printing and data transfer speed through the new USB 2.0 High Speed interface. The Canon EOS 20D digital SLR incorporates the same new RAW format featured in Canon digital cameras from the EOS-1D Mark II model onward. The file extension is .CR2 (Canon RAW, 2nd edition). The RAW data records the white balance data, processing parameters, and other settings. All these settings can be edited freely with compatible RAW file conversion software such as Canon's EOS Viewer Utility and Digital Photo Professional software, which are supplied with the camera. There is no need to worry about color space any longer. The EOS 20D complies with DCF 2.0, revised to support Adobe RGB, and Exif 2.21. Images taken in Adobe RGB will have the Adobe RGB color space information, not the ICC profile, appended to the Exif information. (If Adobe RGB is selected from the 20D digital camera's Color Space menu, all processing parameters are available.) Therefore, applications and devices compatible with DCF 2.0 and Exif 2.21 will be able to handle Adobe RGB in the same way as sRGB. When software compatible with Exif 2.21 is used, images captured with the EOS 20D will open automatically in the Adobe RGB color space. When a printer that complies with Exif 2.21 is used, the printer will adjust the color saturation of the print suitably. As with the EOS 10D model, the EOS 20D digital SLR is compatible with PictBridge, CP Direct and Bubble Jet Direct print transfer protocol. It also enables DPOF Print Ordering, Version 1.1. The basic specifications are the same as those of the EOS-1D Mark II digital SLR. Printer communications can be set to Normal or PTP (Picture Transfer Protocol) with the menu's Communication setting (PTP is required for PictBridge direct printing). PictBridge compliant and Compact Photo Direct printers allow up to eight steps of horizontal trimming, up to five steps of vertical trimming, and a range of print sizes. The EOS 20D will be supplied with the latest versions of Canon's popular Digital Photo Professional and EOS Viewer Utility software, as well as Adobe Photoshop Elements 2.0 for image editing. The EOS 20D will be available in body-only or two separate zoom lens kit configurations. All three kits include the camera body as well as the BP-511A lithium-ion battery pack, Battery Charger CG-580, USB Cable IFC-400PCU, Video Cable VC-100, a wide neckstrap, 3 software CDs, printed instruction manuals, and a 1-year Canon U.S.A. limited warranty. The first zoom lens kit includes the standard EF-S 18-55mm f/3.5-5.6 lens and the second kitâ€ includes the EF-S 17-85mm f/4-5.6 IS USM Wide Angle Zoom lens. 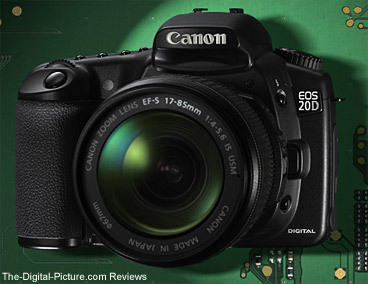 Back to the Canon EOS 20D Review.